Public Talk: April 6 on "Do Bad Times Make Good Economic Policy? Managing Indonesia's Economy in a Globalized World"
Muhamad Chatib Basri shared his experience with policy formation and institution reform from his time as Indonesia’s minister of finance. In addition to his public talk, Basri had lunch and attended happy hour with students and was a guest lecturer in GPS’s Bahasa Indonesia language and Southeast Asian Politics classes. He also met with prominent community members such as Indonesia’s Ambassador at the Los Angeles Consular General. 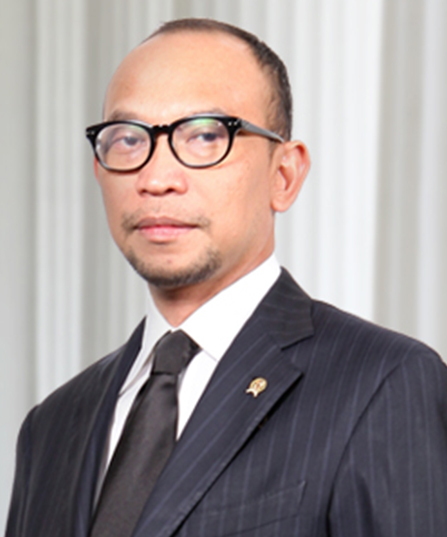 Muhamad Chatib Basri is the former minister of finance of Indonesia. He is currently chairman of the advisory board of the Mandiri Institute. Prior to being the minister of finance, Basri served as a special adviser to the minister of finance of Indonesia from 2006-2010. He also served as the Sherpa to the President of Indonesia for the G-20 meeting in Washington, D.C. (November 2008) and acted as a deputy minister of finance for the G-20 from 2006-2009. He has acted as a consultant for the World Bank, the Asian Development Bank, the USAID, AUSAID, OECD and UNCTAD. Basri earned a Ph.D. in economics from Australian National University (ANU). He also received a master’s in economic development from ANU. He is currently a lecturer in the economics department at the University of Indonesia. Pacific Leadership Fellow Muhamad Chatib Basri's public talk on "Do Bad Times Make Good Economic Policy? Managing Indonesia's Economy in a Globalized World"